Bud Microclimate and Fruitfulness in Vitis vinifera L.
The effect of light on bud fruitfulness of Thompson Seedless (TS), Flame Seedless (FS), Chardonnay (CH), and Cabernet Sauvignon (CS) was studied under field conditions in the San Joaquin Valley of California. Light and temperature effects were also assessed in growth chambers on TS and FS. In field vines, discrete shoot light exposure levels were established by pruning and shoot positioning. Bud light interception was measured weekly from April through August and continuously during seven days at the end of April. Potential fruitfulness was assessed during dormancy by bud dissections. Observed fruitfulness was assessed visually three weeks after budbreak. Shoot light exposure had a significant effect on potential fruitfulness of all cultivars and on observed fruitfulness of TS and FS. The most fruitful cultivar was CH, followed by CS, FS, and TS. Maximum potential fruitfulness in TS and CS occurred at approximately one-third of full sunlight, whereas in CH and FS fruitfulness continued to increase with irradiance. Fruitfulness in TS and FS was not affected by bud orientation or location within the canopy. Midday light interception by individual buds did not correlate with their particular fruitfulness. However, when data from individual buds was pooled by shoot, shoot light microclimate significantly correlated with potential fruitfulness. Maximum fruitfulness in TS and FS under controlled conditions occurred at 25°C but was drastically reduced at 32°C in TS and at 18°C in FS. Again, there was no relation between individual bud light exposure and fruitfulness. Induction and differentiation of grapevine inflorescence primordia for the next year’s crop begins soon after bud-break of the current season (May and Antcliff 1963) and is completed between veraison and harvest (Swanepoel and Archer 1988). During this period, commercial table or wine grape vineyards undergo several manipulations that determine canopy microclimate. While excessive sunlight exposure of the interior of the canopy can cause sunburn of the current season’s fruit, too much shade is associated with low bud fruitfulness during the following season (May et al. 1976, Corzo 1978). However, it is not known how much sunlight (quantity or length of exposure) is necessary to achieve maximum bud fruitfulness or if fruitfulness can reach saturation levels as a response to solar radiation under field conditions. As one of the premises for crop yield, grapevine bud fruitfulness has been the focus of many studies, the majority dating more than 30 years and reviewed by several authors (Buttrose 1974a, May 2000, Srinivasan and Mullins 1981). Since productivity in important cultivars may vary widely from year to year or among locations, a good part of this research has focused on the environmental regulation of fruitfulness and has determined that light and temperature are the most important climatic factors for inflorescence induction and differentiation. Most studies have considered these two factors independently by statistically correlating historical weather data during bud development with counts of inflorescences (Baldwin 1964), by modifying canopy or bud microclimate in the field (Corzo 1978, May 1965, May and Antcliff 1963, May et al. 1976, Smart et al. 1982), or by more precisely adjusting light and temperature under controlled conditions (Buttrose 1968, 1969a,Buttrose b, 1970a,Buttrose b, Morgan et al. 1985). The results invariably show a direct correlation of shoot light exposure and temperature with fruitfulness. High temperatures have been found to promote fruitfulness in developing grapevine buds. In a study covering 18 years of data collection, the percentage of fruitful buds in Thompson Seedless (TS) correlated highly with air temperature and hours of sunshine during a 20-day period at the beginning of a season (Baldwin 1964). This critical period corresponds to growth stages 13 to 18 of the modified Eichhorn and Lorenz system (Coombe 1995). When air temperature alone was varied in a growth chamber study (Buttrose 1969b), bud fruitfulness of Muscat of Alexandria rose from zero at 20°C to a maximum close to 35°C, and was followed by a steep decline beyond 35°C. Temperature optima for bud fruitfulness was higher than for vegetative growth. In a related study, the same author found that air temperature had its maximum effect on fruitfulness of a bud during the period in which its subtending node moved from the shoot apex to a position 10 nodes below (Buttrose 1969a). The initiation of reproductive growth at such an early stage of bud development was also confirmed in a field study where nodes of Chasselas Doré, Pinot noir, and White Riesling were tagged as soon as they separated from the apex and the fruitfulness of the subtended bud was correlated to temperatures on the day of tagging and on each of nine days before or after tagging (Palma and Jackson 1981). Bud fruitfulness was significantly correlated with temperatures when the subtending leaf was 1.5 cm in diameter and there were three visible nodes between the bud and the apex. 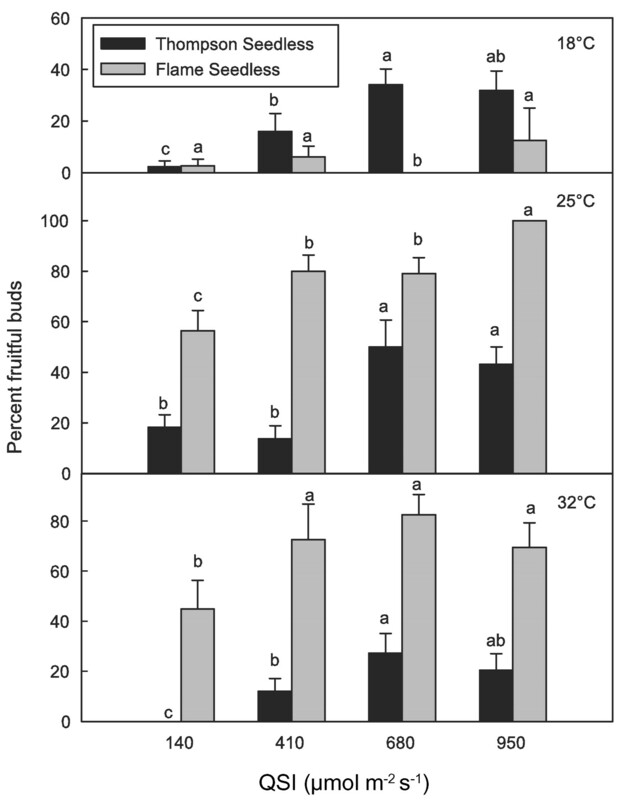 Considerable variation was found in the response curves of fruitfulness to temperature in five grapevine cultivars grown in growth chambers (Buttrose 1970b). The meteorological element best correlated with bud fruitfulness of TS was hours of bright sunshine during a period of 20 days in the spring in a study from Australia (Baldwin 1964). When shoot microclimate was modified by training system in Concord (Shaulis et al. 1966) and TS (Shaulis and May 1971), or by positioning in TS (May et al. 1976), fruitfulness of individual shoots was positively correlated to light exposure. Shading of whole TS vines during a period of about six weeks affected bud fertility (May and Antcliff 1963). The authors assumed that the critical period, although short for each individual bud, is prolonged for whole cane-pruned vines because of differences in time of development between buds of different shoots and at different node positions. Similar results were obtained in field TS vines by growing individual shoots inside horizontally placed shading tunnels or under natural shade (Corzo 1978). In another field study, shading of individual shoots of Palomino grapevines during one season decreased bud fruitfulness and budbreak the following season (Hopping 1977). Shading individual buds was found to be sufficient to reduce fruitfulness in TS (May 1965). Heavy shading up to complete darkness consistently reduced the number and size of inflorescence primordia and the size (by weight) of leaf primordia. The reduction in fruitfulness could not be related to changes in the spectral quality of light or in bud temperatures (indirect measurements). It was proposed that shading might reduce bud fertility at least partly by affecting leaf development inside the bud and that leaf primordia had to reach a certain size and be illuminated in order for the photo-chemical reactions leading to floral induction to proceed (May 1965). Side effects on bud temperature or bud gas exchange resulting from the physical qualities of the shading materials (aluminum foil and cellophane) used in these studies were not thoroughly addressed this study. In all field studies involving the effect of light, bud fruitfulness is reported only in relation to categorical light exposure treatments instead of a continuous irradiance scale. Growth chamber studies in which grapevines were grown under different light levels have confirmed the results obtained in field studies (Buttrose 1969b, 1970b). Although the maximum amount of light available at these particular chambers was equivalent to only one-quarter of full sunlight, an increase in light intensity resulted in enhanced inflorescence primordia number and size. Fruitfulness appeared to be reaching a maximum at this intensity under conditions of 16-hr days and 25°C, and it was suggested that the mechanism leading to fruitfulness in grapevines could be saturated by light at intensities well below those of full sunlight (Buttrose 1974b). However, the response curves of fruitfulness to light obtained for five cultivars (Buttrose 1970b) seem to support these conclusions in only one case. 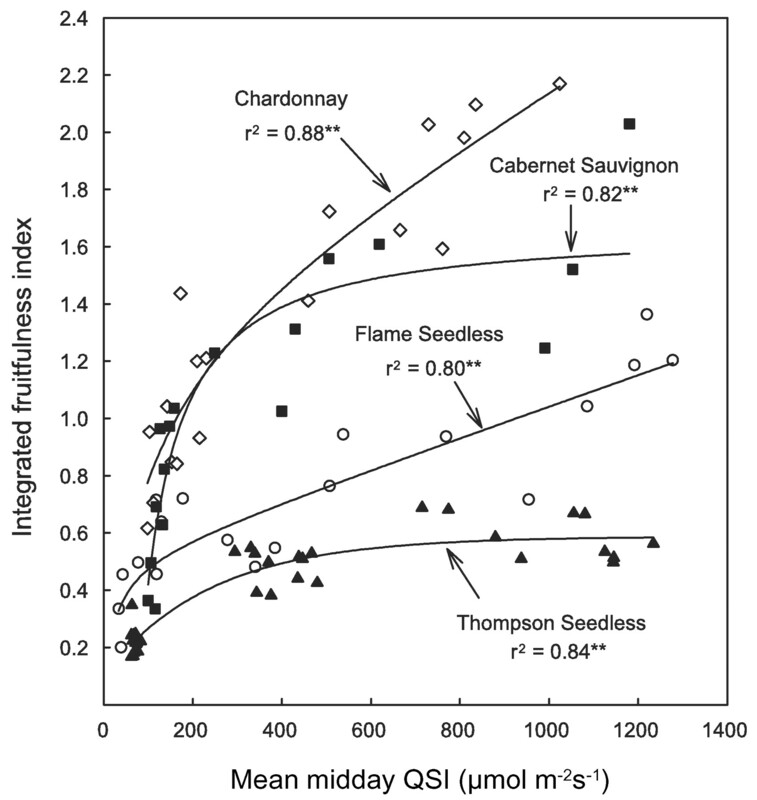 There were three general objectives of the present study: (1) to develop response curves of bud fruitfulness to light in the four most important table and wine grape cultivars of California—Thompson Seedless (TS), Flame Seedless (FS), Cabernet Sauvignon (CS), and Chardonnay (CH)—under conditions of the central San Joaquin Valley; (2) to investigate if the fruitfulness of single buds could be explained by their specific light microclimate at the time of induction and early differentiation of inflorescence primordia; and (3) to study the effects of light and temperature on bud fruitfulness of TS and FS under controlled conditions and compare the results with those obtained in the field. Field experiments were conducted in 2001 at the University of California Kearney Agricultural Center, located in the central San Joaquin Valley (36°36′N, 119°31′W), on a Hanford fine sandy loam. Plant material consisted of 12-year-old, own-rooted, drip-irrigated TS (clone 2A) and FS (clone 1) vines and 8-year-old, flood-irrigated CS (clone 8) and CH (clone 4) vines. All vines were planted in east-west oriented rows. All cultural practices were applied uniformly across treatments and in accordance with standard commercial practice for each cultivar. Experimental layout and statistical analyses. Basic trellis dimensions in the four cultivars are noted in Table 1⇓. Four overhead wires were installed at even spaces on top of the cross arms used for the foliage wires. Canes from buffer vines, which alternated with experimental vines along the row, were retained at pruning time. A fixed number of these canes (10 on each side of the head in TS and six on each cordon in the other cultivars) were laid on the overhead wires above the experimental vines in order to provide various levels of natural shade to experimental shoots. Three or four discrete shoot light exposure levels were arranged beginning at pruning time. TS vines were head-trained and the remaining cultivars were trained to bilateral cordons. As the season proceeded after bud-break, the desired separation among light exposure levels was maintained by removing leaves and by removing or positioning shoots growing from the overhead canes. All vines were irrigated and treated for pests and diseases as needed. In order to keep shoots as uniform as possible and free of variable competitive sinks, all clusters were removed in experimental vines and all lateral shoots were pinched off as soon as possible on experimental shoots. Vine spacing and trellis configuration of cultivars used in the study. 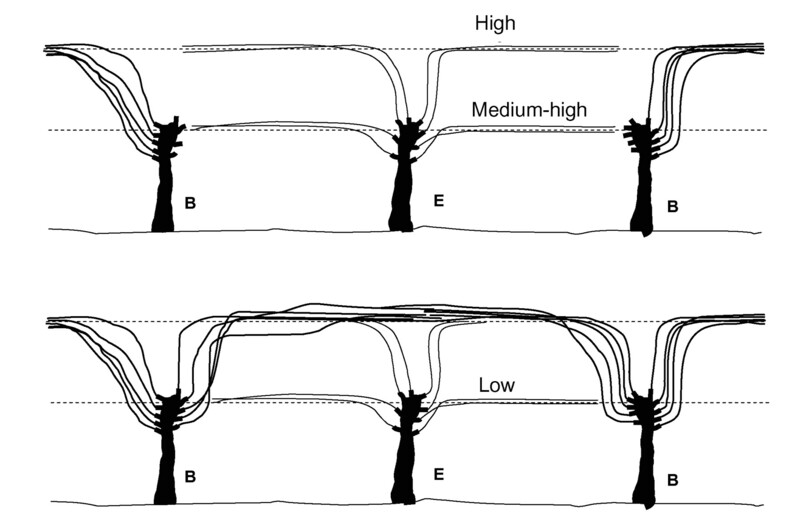 In order to establish three light exposure levels, shoots were trained on two additional wires (held by a second set of cross arms) located along both sides of the vines at 1 m aboveground and 0.5 m from the center of the row (low and medium-high light exposure levels) or on the outer foliage wires, 1.8 m aboveground and 0.5 m from the center of the row (high light exposure level). Shoots in the low light exposure level were laid over the lower wires under the overhead canes. Shoots in the medium-high and the high light exposure levels were laid on the lower and higher wires, respectively, without any shade. Shoots in the high light exposure level provided moderate shade to those in the medium-high level. Only eight shoots were allowed to grow from the head of the vine, and each treatment occupied four shoots (Figure 1⇓). There were a total of 16 blocks for a total of 32 experimental vines, each containing all treatments. Since TS is a cane-pruned cultivar, evaluations were made on buds of the basal 15 nodes. Results were analyzed as randomized complete blocks and means were separated by Tukey’s method. Observations within treatments were averaged across all shoots evaluated in each block, except when vine side and bud orientation were considered as factors. Schematic representation of the three shoot light exposure treatments used in Thompson Seedless vines. B: buffer vines; E: experimental vines. Flame Seedless, Chardonnay, and Cabernet Sauvignon. Twelve primary shoots per vine were allowed to grow, three on each of the four quadrants formed by the two cordons and the south or north side of the vines (Figure 2⇓). Two light exposure levels per vine were set, one per cordon, in fixed combinations of low and medium-low or medium-high and high. In addition to presence or absence of overhead canes, noncount shoots were either allowed to grow on the cordons or eliminated, thus providing the four light exposure levels. 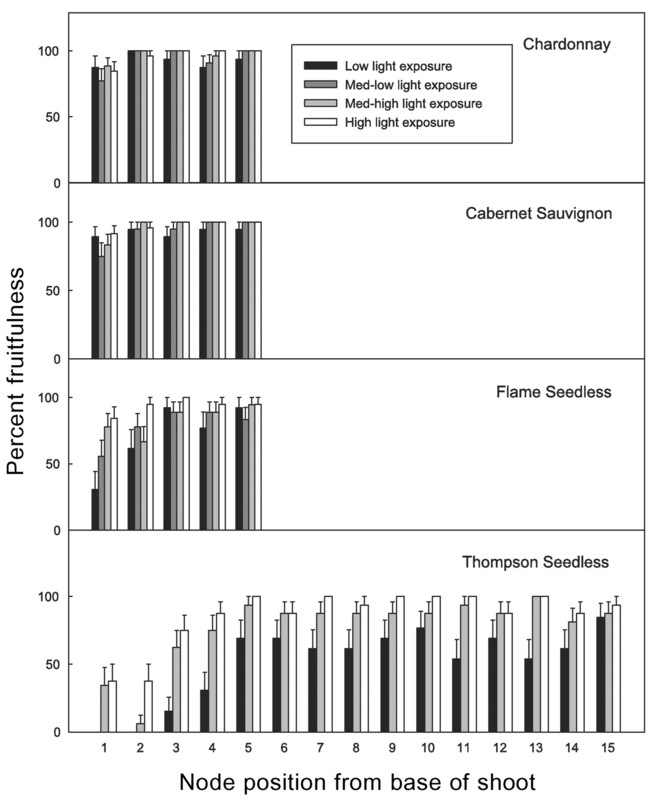 Schematic representation of the four shoot light exposure treatments used in Flame Seedless, Chardonnay, and Cabernet Sau-vignon vines. B: buffer vines; E: experimental vines. Experimental shoots were allowed to grow more or less vertically and were tied to the foliage wires if necessary to keep them apart. Once they cleared the foliage wires they were allowed to arch naturally until their distal portions became pendant. Between 8 and 10 nodes in the experimental shoots developed between the cordons and the foliage wires. There were a total of 16 replicates per treatment, each replicate containing six shoots. Observations in each replicate were averages from all shoots. Since FS, CS, and CH are traditionally spur-pruned in California, evaluations were made on buds of the basal 5 nodes. Results were analyzed as a repeated measures design, with presence or absence of overhead canopy being the between-subjects factor, presence or absence of noncount shoots as canopy fillers the first within-subject factor, and node position as the second within-subject factor. Mean separations were by Tukey’s method. All analyzes were performed using SAS statistical software (version 8.0.1; SAS Institute, Inc., Cary, NC) and plotted using SigmaPlot (version 17.0.0.21; SPSS Inc., Chicago, IL). Midday measurements of quantum scalar irradiance (incident radiation from all directions onto a spherical collecting surface; QSI, μmol m−2 s−1) were performed on each bud on eight dates beginning two weeks after budbreak and ending mid-August. QSI was measured with a battery-powered photosynthetically active quantum scalar irradiance probe (model QSL-100; Biospherical Instruments Inc., San Diego, CA) attached to a portable voltmeter. The probe was equipped with a spherical Teflon light-collecting head with a diameter of 19 mm. Calibration of the probe was achieved under a collimated light source in agreement with readings from a LI-190S quantum sensor (cosine-corrected) attached to a LI-185 quantum meter (LI-COR Inc., Lincoln, NB). All node positions from the base of the shoot to number 15 were measured in TS or up to number 5 in the other cultivars. All measurements were performed on clear days within one hour before or after solar noon. Above-canopy QSI ranged from 1,825 to 2,150 μmol m−2 s−1 when measurements were taken. Simultaneous diurnal measurements of bud temperature and QSI were carried out on TS and FS on 3 May, 14 June, and 18 July 2000. Measurements were performed bi-hourly on 12 shoots per cultivar, representing all light exposure levels. Bud temperatures were measured by inserting into the buds a hypodermic thermocouple attached to a portable digital readout (model HH23; Omega Engineering, Inc., Stamford, CT). Diurnal photosynthetically active radiation (PAR) was measured continuously from 21 to 28 April 2000 on CH buds with 3 x 5 mm G1118 GaAsP photodiodes (Hama-matsu Corp., Bridgewater, NJ), which were placed next to the buds and aligned with their axes. Because of their small size they did not interfere with light interception by the buds. Variable resistors were used in order to normalize their output within 0 to 15 mV for PAR values from 0 to 2,000 μmol m−2 s−1. Calibration of each photodiode was performed under a collimated light source. Using data loggers, PAR was measured every 10 seconds, and the average, maximum, and minimum values for each 10-min interval were recorded. Average daily incident PAR (mol m−2 day−1) was calculated for the 7-day recording period. Eight randomly selected buds from the second and third nodes of data shoots were measured per light exposure treatment; four in the north and four in the south side of vines. The potential yield of the grapevine for the next season or potential fruitfulness is indicated by the number and size of the inflorescence primordia at the onset of dormancy (May and Antcliff 1973, Williams 2000). Reductions in the number of inflorescences at bloom can occur as a result of winter pruning, climatic conditions during or after budbreak, or to failure of a bud to break. Fruitfulness assessed after break is referred here to as observed fruitfulness. In this study potential fruitfulness was assessed by bud dissection. Half of the canes within each light exposure treatment were collected immediately after leaf fall and kept in cold storage. Equal amounts of randomly selected north and south canes were selected and bud dissections were performed under a stereo microscope by slicing thin sections perpendicular to the buds axes with a razor blade. The number of inflorescence primordia in primary and secondary buds was recorded separately. Once the inflorescence primordia were reached during dissections, the maximum inflorescence primordia diameter was measured in mm with a microscale graduated in 0.1-mm increments. Potential bud fruitfulness was expressed as percent bud fruitfulness (percent buds with one or more inflorescence primordia), inflorescence primordia per bud (inflorescence primordia in the primary or the secondary buds or both), and integrated fruitfulness index or IFI (sum of the diameters of all inflorescence primordia per bud in mm). Both the number of inflorescence primordia per bud and their size are developmental factors contributing to crop yield (May 1972). The number of primordia per bud affects the number of inflorescences per vine, whereas the size of the primordia affects the number of flowers per inflorescence or the number of berries per cluster. By integrating these two factors in one magnitude, IFI seemed a more accurate measure of potential fruitfulness worth considering for grapevines. Observed fruitfulness was assessed in the following season, for each node on the remaining canes of vines, when shoot length was ~30 cm. Observed fruitfulness was expressed as number of inflorescences per node. Internode length, diameter and volume (of the cylinder subscribed by diameter and length), and bud location and orientation (north or south side of the vine and direction toward which buds were facing) were recorded in the vineyard before cane removal. Two-year-old dormant TS or FS vines (in 4-L pots) were transferred from a field nursery or from cold storage into large, walk-in growth chambers (model PGV36; Conviron, Winnipeg, Canada). The plants were then pruned to one 3-bud spur and forced out of dormancy at 25°C, 60% relative humidity, and 14-hour days at 300 μmol m−2 s−1. One week later temperatures in the chambers were set to 18, 25, or 32°C and the lamps (mixture of incandescent and sodium halide) to maximum intensity. Four irradiance treatments equivalent to approximately 7, 21, 35, and 50% of sunlight (140, 410, 680, and 950 mmol m−2 s−1; or 7, 21, 34, and 48 mol m−2 day−1) were established equally in each chamber by attaching the pots at four different heights against the lateral inside walls and training the shoots horizontally toward the opposite walls. Only one shoot per plant was allowed to grow. Opposite growing shoots were trained downward after running into each other at the center of the chamber; at this point their length was usually 15 to 20 nodes. Because of their known erratic growth (Buttrose 1968), lateral shoots were carefully pinched off as soon as they appeared. Four single-pot replicates were established per light exposure level, and shoots within each treatment were offset to avoid direct shading among treatments. Pots were irrigated through an automated system with half-strength Hoagland’s solution. When TS leaves were fully expanded on the horizontal sections of the shoots, light exposure of individual buds was assessed in the basal 15 nodes with a LI-COR LI-190S quantum sensor. The sensor was placed at the distal end of the buds and aligned with their axes. The plants were removed from the chambers after 1,700 degree days (°D, 10°C base), when the basal 15-node portion of the shoots was completely lignified. TS requires ~1,700°D from budbreak to harvest in the San Joaquin Valley (Williams et al. 1985). Buds from node positions 1 to 15 in TS and 1 to 12 in FS were dissected and evaluated for fruitfulness under a microscope by recording presence or absence of one or more inflorescence primordia per compound bud (percent fruitfulness). The effect of treatments on percent fruitfulness was evaluated separately for each cultivar. Fruitfulness scores from all node positions 5 to 15 in TS and 1 to 12 in FS were averaged for each replicate and analyzed within a completely randomized split-plot design, with temperatures as main plots and light levels as sub-plots. Increasing shoot light exposure levels significantly increased IFI in all cultivars (Figure 3⇓). Winegrape cultivars were more fruitful than table grapes, with CH reaching the highest IFI and TS the least. When all nodes were considered in the statistical analysis, there was also a significant effect of bud position on IFI. In TS there was a marked difference in fruitfulness between the basal 4 nodes and the remaining 11 nodes. When they were analyzed as separate data groups, the effect of node position on fruitfulness was significant for positions 1 though 4 but not for positions 5 through 15. Although fruitfulness of the basal nodes was in general lower than that of more distal nodes in the spur-pruned cultivars, the difference was not as large and affecting as many nodes as in TS. This result in TS agrees with previous reports (Antcliff and Webster 1955, Barnard 1932, Barnard and Thomas 1933, May et al. 1976, 1982, Williams 2000). Even when shoots were exposed to full sunlight throughout the day, the persistently lower fruitfulness of the basal four nodes suggests that under conditions of the central San Joaquin Valley this genetic trait may not be reversible by conventional cultural practices (Williams 2000). This is evidenced by the fact that, even in highly fruitful years or when using modern trellising systems with better light distribution, growers will still cane-prune TS in the San Joaquin Valley. Most of the crop in this cultivar originates from nodes other than the basal four (Figures 3⇓ and 4⇓). Potential fruitfulness expressed as integrated fruitfulness index (IFI) by cultivar, shoot light exposure level, and node position (treatment means). IFI is the sum of average maximum diameters of all inflorescence primordia (mm) when dissected during dormancy. Standard error bars at 95% confidence. Potential fruitfulness of Thompson Seedless expressed as mean inflorescence primordia per node. Values are averages for each node across shoot light exposure treatments. QSI: quantum scalar irradiance. The maximum number of inflorescence primordia per node in TS was four, two of them located in the primary bud and the other two in one or both secondary buds. In this cultivar, secondary buds with two inflorescence pri-mordia occurred only in compound buds with only one secondary bud or a secondary bud that was considerably larger than its counterpart. All other cultivars developed triple inflorescence primordia in primary buds and up to seven per node; three in the primary and two on each secondary bud. Primary buds with triple primordia occurred only in shoots under high light exposure in FS, under high and medium-high light exposure in CH, and under all light exposures in CS (data not presented). Shoot light exposure significantly influenced the number of inflorescence primordia in secondary buds. The contribution of secondary buds toward potential fruitfulness in terms of inflorescence primordia per node on all cultivars ranged from zero to about 65% and increased with shoot light exposure (Figure 5⇓). This response was steepest in FS, where more than 60% of the inflorescence primordia in nodes 3 to 5 of shoots under high light exposure were produced on secondary buds compared to less than 5% in shoots under low light exposure. (Figure 5⇓). The low fruitfulness of secondary buds in TS is the reason why this cultivar (and to a lesser extent FS) does not have a good reservoir of dormant inflorescence primordia to replace the primary shoots if they are killed by frost after budbreak (Winkler 1933). Contribution of secondary buds to potential fruitfulness per node by cultivar, shoot light exposure level, and node position (treatment means). Standard error bars at 95% confidence. Response curves of fruitfulness to shoot light exposure further characterize the differences among cultivars. CH reached between 1.5 and 3.5 times higher IFI than TS (nodes 5 to 15) throughout the range of mean midday QSI values (Figure 6⇓). Two distinct types of responses also occurred. While fruitfulness of CS and TS seemed to reach maxima at about one-third of full sunlight (above-canopy QSI was ~2,000 μmol m−2 s−1), fruitfulness in CH and FS did not seem to saturate at any point throughout the range of mean midday QSI values recorded, suggesting that sunlight distribution throughout the canopy and capture by the shoots would have to be carefully tuned in “saturable” cultivars of the first type, especially those like TS with generally low IFI. Integrated fruitfulness (as integrated fruitfulness index) response curves to midday quantum scalar irradiance (QSI) for all cultivars. Symbols are averages by light level and node position. Only node positions 5 to 15 are considered in Thompson Seedless. Above-canopy QSI levels were ~2,000 μmol m−2 s−1. Regressions (p < 0.0001 for all): Chardonnay [y = (134.1x)/(93.8+x)+0.0911x]; Cabernet Sauvignon [y = 165.54-(8618.98)/((1+0.44x)1/0.89)]; Flame Seedless [y = (50.94x)/(21.7+x)+0.054x]; Thompson Seedless [y = 58.8-(48.81)/((1+0.0001x)1/0.021)]. Clusters and lateral shoots were removed early during shoot development, giving the shoots an advantage not typical of actual field conditions. Nonetheless, the low end light exposure levels were still able to significantly restrict bud fruitfulness. Absolute fruitfulness to light exposure relationships obtained here may be biased on a shoot-by-shoot basis because of the absence of these competitive sinks. Light had a significant effect on the size of inflorescence primordia in primary buds but not in secondary buds. In primary buds the diameter of inflorescence primordia increased proportional to light exposure in all cultivars (results not shown). In contrast, inflorescence primordia from secondary buds were much smaller and uniform throughout light exposure treatments. That may explain why, even in well-selected canes, shoots emerging from secondary buds will tend to produce smaller clusters than shoots emerging from primary buds (Dry 2000). Counts of inflorescences per node after budbreak or observed fruitfulness are summarized by treatment in Table 2⇓ and compared with their corresponding values for potential fruitfulness, expressed as inflorescence primordia per node. As expected, observed fruitfulness was lower than potential fruitfulness in most cases, and the difference, indicated by their ratio, was larger in shoots under high light exposure. This is explained by the fact that potential fruitfulness here included inflorescence primordia from secondary buds which did not emerge in the spring and therefore did not contribute to observed fruitfulness. At budbreak, almost three times more shoots emerged from secondary buds in CH than in CS shoots under high and medium-high shoot light exposure levels (results not shown). This finding explains why observed fruitfulness in CH was higher than in CS under these conditions, even though potential fruitfulness on CH was lower than in CS. The effect of shoot light exposure on observed fruitfulness was significant only in TS and FS. In CS and CH, shoots from secondary buds in the low and medium-low light exposure treatments were much more fruitful than those of TS and FS (Figure 5⇑). This had a leveling effect on observed fruitfulness across light exposure treatments in CS and CH and explains the lack of significance. In cultural terms, these results suggest that under conditions of the central San Joaquin Valley, observed fruitfulness of CS and CH may not be significantly limited by shoot light microclimate. Consequently, selection of fruiting wood in these two cultivars would not require the rigor necessary in TS and FS. Nonetheless, by selecting spurs from canes that were well exposed the previous season, growers would at pruning ensure a strategic reservoir of fruitful secondary buds for resprout in the event of frost damage. The effect of shoot light exposure on inflorescence dry weight, measured approximately three weeks after budbreak, is summarized in Table 3⇓. Since measurements were not performed on a degree-day basis and cultivars differed in their budbreak dates, dry weights were normalized assuming the highest value within each cultivar to be 100%. Inflorescence dry weight decreased as shoot light exposure in the previous season diminished. The effect was significant for all cultivars, especially TS (Table 3⇓) where the reduction was drastic. This can be attributed to relative absence of double and triple clusters in shoots from primary buds in TS and the small contribution (smallest among cultivars) of inflorescence primordia from secondary buds to node fruitfulness, especially as light exposure decreased (Figure 5⇑). Effect of shoot light exposure level on relative inflorescence dry weight per node. IFI was a more precise measurement of potential fruitfulness whereas percent fruitfulness was a better predictor of observed fruitfulness (Figure 7⇓). In comparison, IFI scores (Figure 3⇑) provided higher separation among treatments. Although percent fruitfulness is commonly found in the literature (Antcliff and Webster 1955, Sommer et al. 2001, Williams 2000), it ranks buds with one or more inflorescence primordia as 100% fruitful. However, nodes with multiple primordia or one or more fruitful secondary buds have higher yield potential and are capable of contributing fruit after winter freezes kill the more susceptible primary buds (Goffinet 1991) or late frosts obliterate the tender primary shoots and their inflorescences during the weeks immediately following budbreak (Khanduja and Balasubrahmanyan 1971, Winkler 1933, Winkler et al. 1974). Since number and size of inflorescence primordia are first in a series of intrinsic and cultural factors, from flower induction to harvest, determining grapevine crop yield (Dry 2000, Kliewer 1980, May 1972, 2000), IFI seems a more inclusive measure of potential fruitfulness. Only basal nodes in TS and FS averaged less than one inflorescence primordium per node, therefore showing larger differences in percent fruitfulness among treatments. Potential fruitfulness expressed as percent bud fruitfulness by cultivar, shoot light exposure level, and node position (treatment means). Standard error bars at 95% confidence. In areas where freezes or late frosts are rare, it is expected that most of the crop is provided by shoots derived from primary buds. In this case IFI would overestimate observed fruitfulness, especially in very fruitful cultivars with fruitful secondary buds, whereas percent fruitfulness would be a closer predictor. Indeed, when both measures of potential fruitfulness where correlated to observed fruitfulness (Table 4⇓), correlation coefficients were generally higher for percent fruitfulness. To use IFI as a good crop predictor, it would be helpful to separately record measurements of primary and secondary buds. 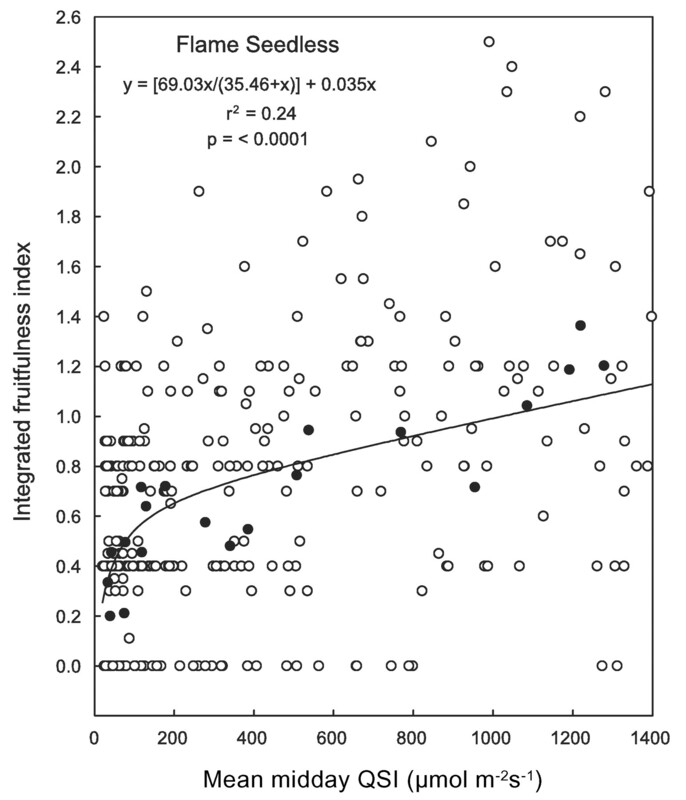 Correlation coefficients of percent fruitfulness or integrated fruitfulness index with observed fruitfulness under four light levels. Light exposure and fruitfulness of individual buds. The widely accepted concept that direct sunlight interception by buds enhances grapevine fruitfulness (Buttrose 1974a, May 1965, Perez and Kliewer 1990, Williams 1992, 2000, Williams et al. 1994, Winkler et al. 1974) was the main reason behind performing light measurements directly on the buds in this study. 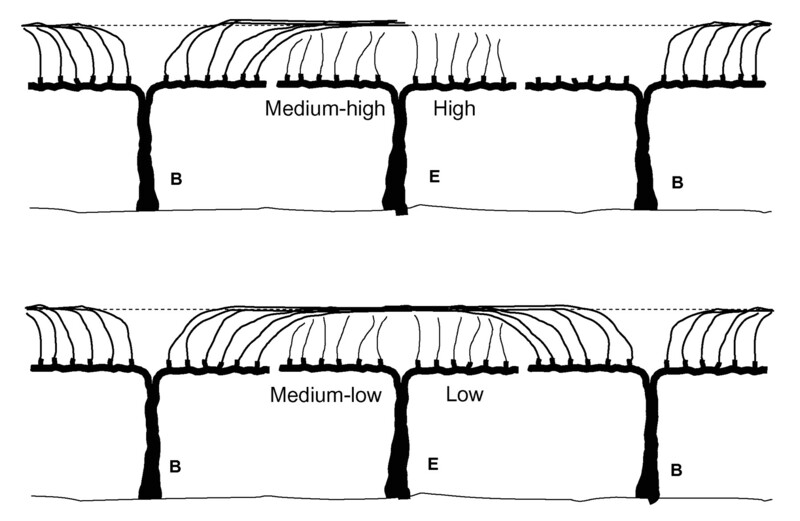 Under this assumption, it would be reasonable to expect that buds facing away from the center of the canopy or those located on the south side of east-west rows (in the northern hemisphere) would intercept more light and be significantly more fruitful than those facing toward the inside of the vines or than those located on the north side. However, when bud orientation and vine side were analyzed as additional factors within shoot light exposure level and bud position in TS and FS, their effect on potential fruitfulness was not significant. In addition, when all IFI values were plotted against midday QSI (see Figure 8⇓ for FS as example) the dispersion was wider than would be expected under the above premise. However, the correlation coefficient improved dramatically when the means by light exposure level and by bud position were plotted against their corresponding mean midday QSI values (r2 = 0.80 in Figure 6⇑ vs. r2 = 0.24 in Figure 8⇓). Since the integration of data from all bud positions results in shoot light microclimate, these findings would indicate that shoot light microclimate rather than bud light interception is the main factor determining bud fruitfulness. Potential fruitfulness (as integrated fruitfulness index) response curves of Flame Seedless to midday quantum scalar irradiance (QSI). Open circles represent data from individual buds (mean of eight dates for each bud). Closed circles are averages by node and light exposure treatment as reference (from Figure 6⇑). Correlation coefficient and linear regression parameters are for data represented by open circles. Measured above-canopy QSI levels were ~2,000 μmol m−2 s−1. 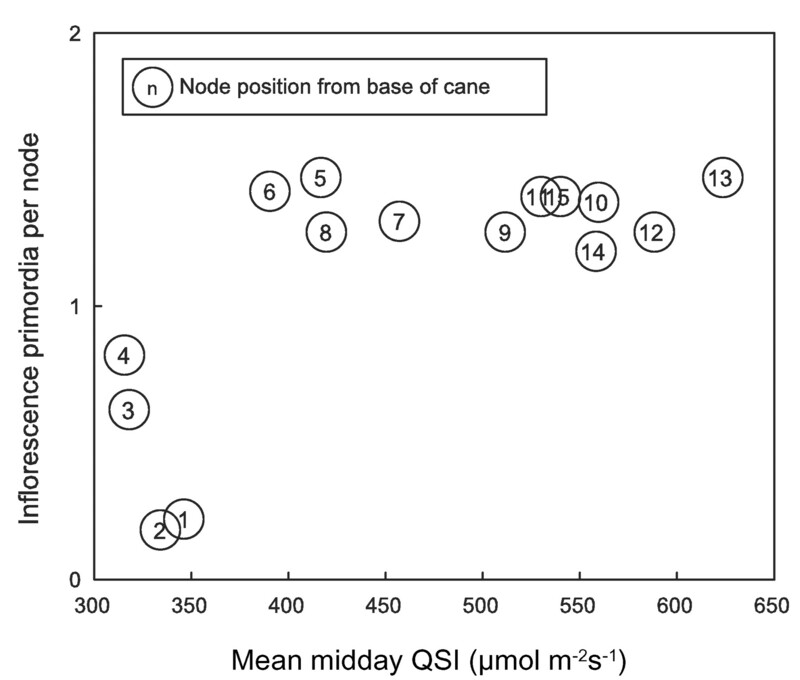 Another reason for the lack of correlation between light and fruitfulness in individual buds could be that instantaneous midday QSI determinations did not represent the total radiation intercepted by the buds throughout the day. Although the spherical collector used for midday QSI measurements had a buffering effect by integrating incident light from all directions, QSI values were still influenced by the intrinsically large difference between direct light and light under one or more leaf layers (Smart 1985). Therefore, when being transiently illuminated by a sun fleck, an otherwise shaded bud could be intercepting at least seven times more light. For these reasons, continuous diurnal logging of bud PAR interception was performed in CH by fitting individual buds with very small photodiodes. The integrated diurnal PAR intercepted by buds in vines representing all shoot light exposure levels and the potential fruitfulness of each of the eight buds studied in each vine are shown in Figure 9a⇓. Again, no correlation occurred between intercepted daily solar radiation and potential fruitfulness of individual buds. Yet, when the data from individual buds were pooled by vine (buds under similar light microclimate), the regression for all vines was significant (Figure 9b⇓), thus reaffirming the notion that shoot rather than bud light microclimate determines bud fruitfulness in grapevines. (A) Potential fruitfulness (as integrated fruitfulness index) responses of individual Chardonnay buds to diurnal quantum scalar irradiance (QSI). Each linear regression plot represents eight buds from a single vine and each vine one of the four shoot light exposure treatments. Diurnal QSI was recorded with photodiodes attached next to buds (in nodes 2 or 3) and aligned with their axes. 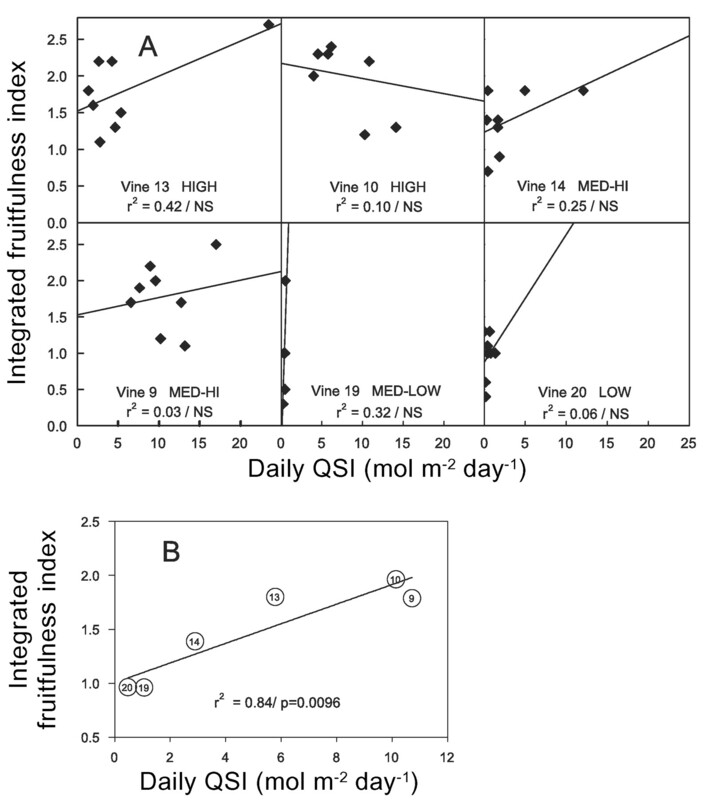 (B) Potential fruitfulness responses of Chardonnay vines to diurnal QSI. Each point represents the fruitfulness and diurnal QSI mean of all buds on each of the six vines in Figure (9a). Corresponding vine number is indicated inside each open circle. Internode diameter was the shoot size parameter best related to bud fruitfulness (Figure 10⇓). Ascending light exposure level significantly increased internode diameter (results not shown), and this effect paralleled that of light on IFI (Figure 6⇑). Potential fruitfulness (as integrated fruitfulness index) in relation to internode diameter. Values are averages by light exposure treatment. Data are from internode 3 in Flame Seedless, Cabernet Sauvignon, and Chardonnay, and internodes 5 to 15 in Thompson Seedless. In agreement with growth chamber studies by Buttrose (1969a,b, 1970b), temperature and light had an overall significant effect on bud fruitfulness of TS and FS under controlled conditions (Figure 11⇓). Both cultivars performed best under 25°C, while TS did better than FS under 18°C and FS better than TS under 32°C. FS performed poorly under 18°C and its leaves developed symptoms of ammonia toxicity (known as “spring fever” in California). Similar to field conditions, TS required less light exposure than FS to reach maximum fruitfulness when grown at 25°C or 32°C. Both cultivars reached maximum fruitfulness at QSI between 680 and 950 μmol m−2 s−1. Maximum QSI in the growth chambers was half of midday above-canopy irradiance in the field. However, since irradiance in the growth chambers was constant during most of the16-hr light period (except for 30-min fade-in and fade-out at the beginning and end of light periods), shoots growing under the high light exposure in the growth chamber intercepted approximately three times more daily irradiance (48 mol m−2 day−1) than their counterparts in the field (see Figure 9a⇑). Under these conditions, daily net carbon assimilation by leaf area unit could have been potentially much higher in the growth chamber than in the field. This fact suggests that shoot photosynthesis would have a more important role in grapevine flowering than direct exposure of the buds to light. This explanation is further strengthened by the fact that light interception by individual buds in the field (Figures 8⇑ and 9a⇑) or in the growth chamber (Figure 12⇓) was not related to their particular fruitfulness. Effect of light and temperature on bud fruitfulness of Thomp-son Seedless and Flame Seedless under growth chamber conditions (16-hr daylight, 25°C, 60% relative humidity). Mean separations by cultivar using Tukey’s method (p > 0.05). QSI: quantum scalar irradiance. Photosynthetic active radiation (PAR) intercepted by individual fruitful and unfruitful buds of Thompson Seedless vines growing under controlled conditions (14-hr days, 25°C, and 60% relative humidity). Values were averaged by light exposure treatment. PAR was measured when leaves were fully expanded. Mean separations by light exposure level using Tukey’s method (p > 0.05). Buds with one or more inflorescence primordia were considered as fruitful. 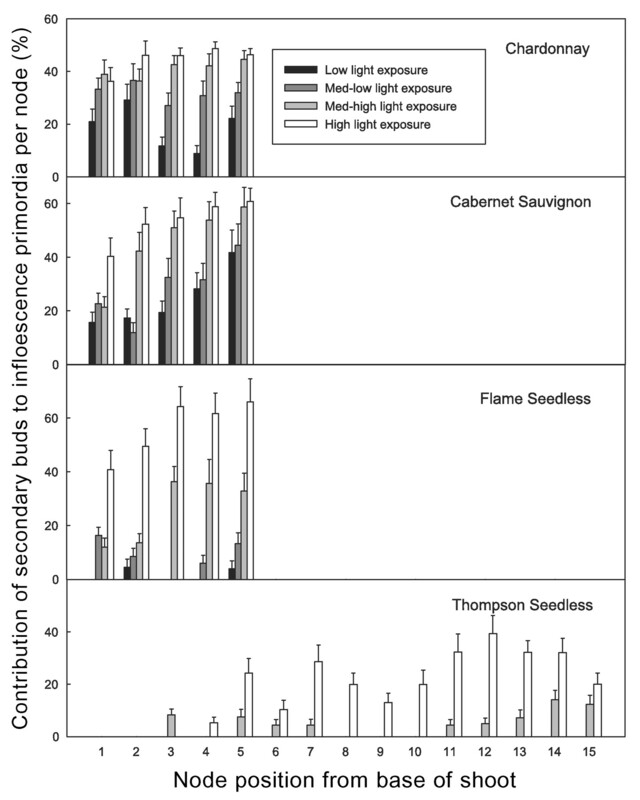 This study contributes a precise quantification and characterization of the effect of bud microclimate on the number and size of inflorescence primordia per node after leaf fall (potential fruitfulness) and the number and size of inflorescences after budbreak (observed fruitfulness) of the four most important table and wine grape cultivars in California under field conditions. By integrating number and size of inflorescence primordia, a new measurement for potential fruitfulness, the integrated fruitfulness index (IFI), was more meaningful than the commonly used percent fruitfulness, which rates buds with one or more inflorescence primordia as equally fruitful. Nonetheless, percent fruitfulness correlated better with observed fruitfulness because not all buds within the compound bud emerged at budbreak. Thus, IFI is mainly a good estimator of the capacity of a node to differentiate inflorescence primordia. Potential fruitfulness responded to light in two ways under field conditions. In TS and CS potential fruitfulness reached maxima at one-third to one-half of full sunlight; in FS and CH it continued increasing along with light. 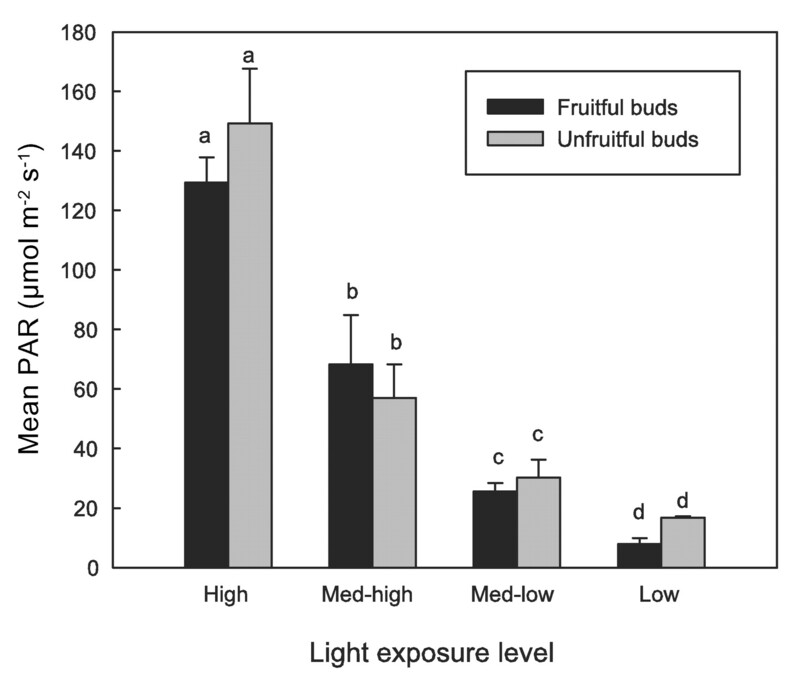 Shoot light exposure had a significant effect on bud fruitfulness; however, through several approaches under field and controlled conditions, this response could not be traced to localized light interception by individual buds but rather to shoot light microclimate. From this perspective, fruitfulness could be more easily optimized in canopy systems that encourage uniform shoot development and light exposure, which would likely result in higher net carbon assimilation and available photosynthates at the time of fruit bud differentiation. Consequently, the role of shoot and bud carbohydrates during grapevine floral induction and differentiation warrants further investigation. Acknowledgments: Financial support was provided by the California Table Grape Commission, the California Competitive Grant Program for Research in Viticulture and Enology, and the USDA Viticulture Consortium Program. The authors thank Nona Ebisuda, Don Katayama, and Juan Gomez for technical assistance, as well as Dr. Larry Williams and Dr. Vito Polito for their helpful comments regarding the manuscript. Antcliff, A.J., and W.J. Webster. 1955. Studies on the Sultana vine. 1. Fruit bud distribution and bud burst with reference to forecasting potential crop. Aust. J. Agric. Res. 6:565–588. Baldwin, J.G. 1964. The relation between weather and fruitfulness of the Sultana vine. Aust. J. Agric. Res. 15:920–928. Barnard, C. 1932. Fruit bud studies. I. The Sultana: An analysis of the distribution and behavior of the buds of the Sultana vine, together with an account of the differentiation and development of the fruit buds. J. Counc. Sci. Ind. Res. Aust. 5:47–52. Barnard, C., and J.C. Thomas. 1933. Fruit bud studies. II. The Sultana: Differentiation and development of the fruit buds. J. Counc. Sci. Ind. Res. Aust. 5:285–294. Buttrose, M.S. 1968. 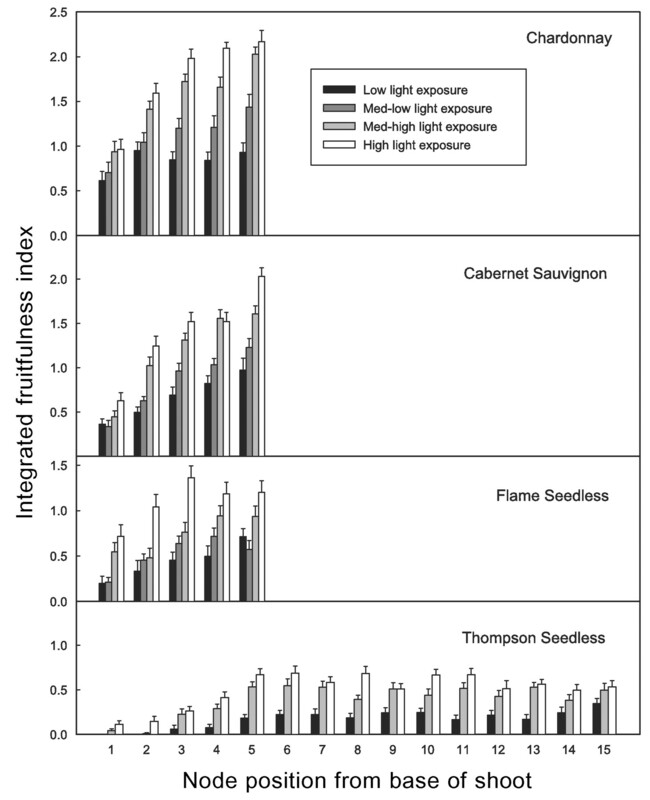 Some effects of light intensity and temperature on dry weight and shoot growth of grapevine. Ann. Bot. 32:753–765. Buttrose, M.S. 1969a. Fruitfulness in grapevines: Effects of changes in temperature and light regimes. Bot. Gaz. 130:173–179. Buttrose, M.S. 1969b. Fruitfulness in grapevines: Effects of light intensity and temperature. Bot. Gaz. 130:166–173. Buttrose, M.S. 1970a. Fruitfulness in grapevines: Development of leaf primordia in buds in relation to bud fruitfulness. Bot. Gaz. 131:78–83. Buttrose, M.S. 1970b. Fruitfulness in grapevines: The response of different cultivars to light, temperature and daylength. Vitis 9:121–125. Buttrose, M.S. 1974a. Climatic factors and fruitfulness in grapevines. Hortic. Abstr. 44:319–325. Buttrose, M.S. 1974b. Fruitfulness in grapevines: Effect of water stress. Vitis 12:299–305. Coombe, B.G. 1995. Adoption of a system for identifying grapevine growth stages. Aust. J. Grape Wine Res. 1:100–110. Corzo, P.E. 1978. Influence of shading on bud fruitfulness and chemical induction of bud-break in Vitis vinifera L. MS thesis, University of California, Davis. Dry, P.R. 2000. Canopy management for fruitfulness. Aust. J. Grape Wine Res. 6:109–115. Goffinet, M. 1991. Buds and shoots of grapevines. Grape Res. News. 2:1–3. Hopping, M.E. 1977. Effect of light intensity during cane development on subsequent budbreak and yield of Palomino grape vines. N. Z. J. Exp. Agric. 5:287–290. Khanduja, S.D., and V.R. Balasubrahmanyan. 1971. Fruitfulness of grapevine buds. Econ. Bot. 25:280–294. Kliewer, W.M. 1980. Vineyard canopy management: A review. In Proceedings of the University of California Davis Grape and Wine Centennial Symposium. A.D. Webb (Ed. ), pp. 342–352. University of California Press, Berkeley. May, P. 1965. Reducing inflorescence formation by shading individual Sultana buds. Hortic. Abstr. 44:319–326. May, P. 1972. Forecasting the grape crop. Aust. Wine Brew. Spirit Rev. 90:46, 48. May, P. 2000. From bud to berry, with special reference to inflorescence and bud morphology in Vitis vinifera L. Aust. J. Grape Wine Res. 6:82–98. May, P., and A.J. Antcliff. 1963. The effect of shading on fruitfulness and yield in the Sultana. J. Hortic. Sci. 38:85–94. May, P., and A.J. Antcliff. 1973. The fruitfulness of grape buds. I. Measuring bud fruitfulness on forced single-node cuttings. Ann. Amélior. Plantes 23:1–12. May, P., P.R. Clingeleffer, and C.J. Brien. 1976. Sultana (Vitis vinifera L.) canes and their exposure to light. Vitis 14:278–288. May, P., P.R. Clingeleffer, and C.J. Brien. 1982. Pruning of Sultana vines to long spurs. Am. J. Enol. Vitic. 33:214–221. Morgan, D.C., C.J. Stanley, and I.J. Warrington. 1985. The effects of simulated daylight and shade-light on vegetative and reproductive growth in kiwifruit and grapevine. J. Hortic. Sci. 60:473–484. Palma, B.A., and D.I. Jackson. 1981. 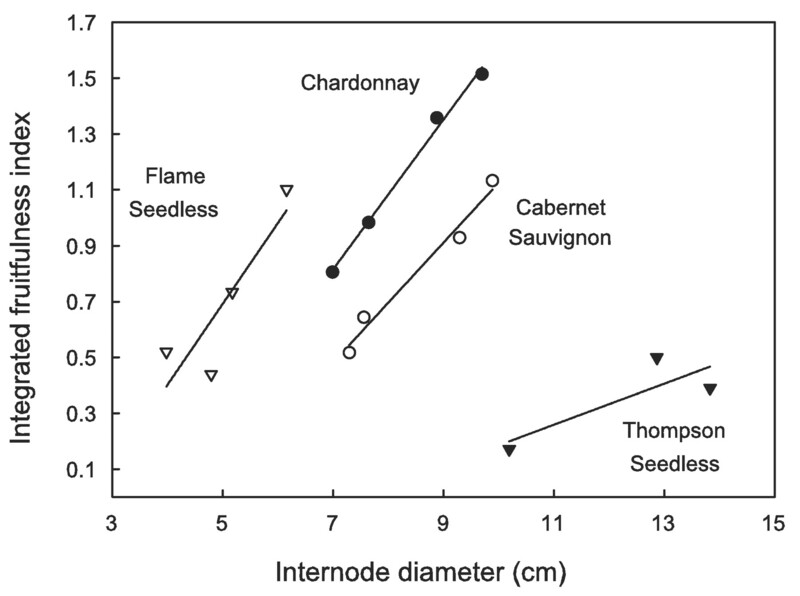 Effect of temperature on flower initiation in grapes. Bot. Gaz. 142:490–493. Perez, J., and W.M. Kliewer. 1990. Effect of shading on bud necrosis and bud fruitfulness of Thompson Seedless grapevines. Am. J. Enol. Vitic. 41:168–175. Shaulis, N.J., H. Amberg, and D. Crowe. 1966. Response of Concord grapes to light, exposure, and Geneva Double Curtain training. Proc. Am. Soc. Hortic. Sci. 89:268–280. Shaulis, N.J., and P. May. 1971. Response of Sultana vines to training on a divided canopy and to shoot crowding. Am. J. Enol. Vitic. 22:215–222. Smart, R.E. 1985. Principles of grapevine canopy microclimate manipulation with implications for yield and quality: A review. Am. J. Enol. Vitic. 36:230–239. Smart, R.E., N.J. Shaulis, and E.R. Lemon. 1982. The effect of Concord vineyard microclimate on yield. II. The interrelations between microclimate and yield expression. Am. J. Enol. Vitic. 33:109–116. Sommer, K.J., M.T. Islam, and P.R. Clingeleffer. 2001. Sultana fruitfulness and yield as influenced by season, rootstock and trellis type. Aust. J. Grape Wine Res. 7:19–26. Srinivasan, C., and M.G. Mullins. 1981. Physiology of flowering in the grapevine: A review. Am. J. Enol. Vitic. 32:47–63. Swanepoel, J.J., and E. Archer. 1988. The ontogeny and development of Vitis vinifera L. cv. Chenin blanc inflorescence in relation to phenological stages. Vitis 27:133–141. Williams, D.W., L.E. Williams, W.W. Barnett, K.M. Kelley, and M.V. McKenry. 1985. Validation of a model for the growth and development of the Thompson Seedless grapevine. I. Vegetative growth and fruit yield. Am. J. Enol. Vitic. 36:275–282. Williams, L.E. 1992. Bud fruitfulness in table grapes. Grape Grower. August:10–13. Williams, L.E. 2000. Bud development and fruitfulness of grapevines, In Raisin Production Manual. L.P. Christensen (Ed. ), pp. 24–29. University of California Division of Agriculture and Natural Resources, Oakland. Williams, L.E., N.K. Dokoozlian, and R. Wample. 1994. Grape. In Handbook of Environmental Physiology of Fruit Crops. B. Schaffer and P.C. Andersen (Eds. ), pp. 83–133. CRC Press, Boca Raton, Florida. Winkler, A.J. 1933. The treatment of frosted grape vines. Proc. Am. Soc. Hortic. Sci. 30:253–257. Winkler, A.J., J.A. Cook, W.M. Kliewer, and L.A. Lider. 1974. General Viticulture. University of California Press, Berkeley, CA. You are going to email the following Bud Microclimate and Fruitfulness in Vitis vinifera L.